WebMetricsGuru: Interactive Telecommunications Program at NYU – A Review – Part 5 of 5. Great article about Dan Smith, the focus of my recent project. Today my friend actually called Dan Smith up and told him about PixTrak — I was too nervous to do it myself. Dan apparently seemed relatively pleased about it, and might even stop by the ITP Show to see it in action! PixTrak: the Dan Smith Tracker is live! So PixTrak, the Dan Smith Will Teach You Rock & Blues Guitar Tracker is now live. Spot a Dan smith poster. Take a picture and send it to ds@pixtrak.com with the address in the body: i.e., 721 Broadway. Works great with cameraphones and MMS, but you can also use regular old-email if you’re so inclined. Let me know if you experience any problems, and rock on! Jenny & Ran’s mobile assassins got blogged at we make money not art! nice, guys! My mobile app will be a MMS game dedicated to New York City bulletin-board guitar legend, Dan Smith.For the uninitiated, Dan Smith has been teaching guitar in New York City for a long long time. I was struck by how often I see his flyers posted around the city â€“ and I wondered, how much does this guy get around? Is it just the East Village, where I usually see these posters, or even the Upper East Side, where Iâ€™ve seen a couple as well. 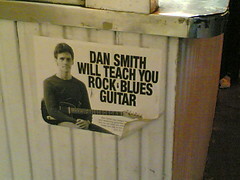 I think lots of New Yorkers must know this Dan Smith guy, even if theyâ€™ve never taken a lesson from him. Thereâ€™s a hidden sense of community lurking behind the bold print and black and white photography: this guy lives in MY city. Following up on last weeks apps for uploading images from cameraphones, Merkitys is an open source image uploading application that works with Flickr. It attempts to providing ‘meaning’ or context to your images by tagging them with location data. It can do this in several ways. First of all, you can type your current location. More conveniently, Merkitys keeps track of cell tower locations and lets you describe them (so when I’m at home I can set name that cell tower ‘home’, and note that it is in brooklyn, ny. Lastly, Merkitys will interact with a bluetooth gps receiver to tag your images with even more specific geosat data. It’s a fascinating concept, and one that I think will make location-based apps more useful — using the intelligence of the platform to contextualize the events of your life. I’ve tried several of the popular photoblogging / moblogging apps, including TextAmerica and Flickr. Both operate on the concept of emailing a photo from your cameraphone to a unique email address which automatically posts the photos to your account.